The January 12, 2013 Ohio DNR report now shows 48 wells classified as producing, roughly 10% of total wells permitted. Below I have compiled some additional data to shed light on activity by company and county. Looking at where wells are currently producing, drilled and drilling is also interesting and could be an indicator of where things appear most promising, though we are still far too early in the process. Production data due to be reported and then released by the Ohio DNR around the 1st of April will surely create a stir. Current Ohio law, which many would like to see changed to require more frequent reporting (quarterly perhaps), requires that "the owner of any well capable of producing oil and gas to report oil, gas and brine production data annually on each well to the Division by March 31 for the preceding calendar year (Ohio Revised Code Section 1509.11)." Many are waiting to obtain additional information on production, especially oil and liquids, in order to determine economics and understand where things are headed. 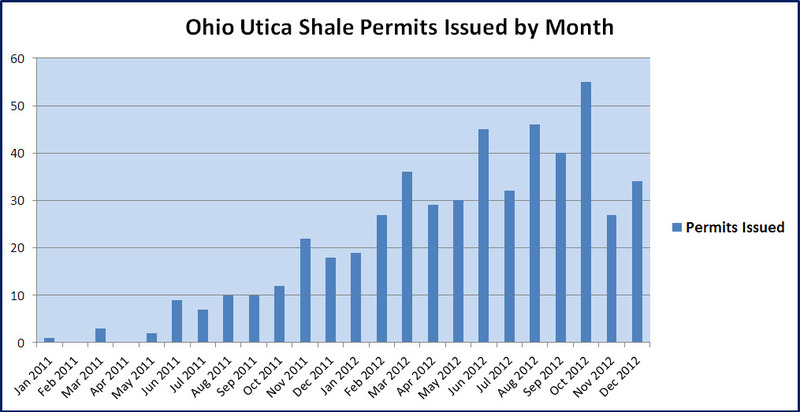 There are still many unknowns in many shale plays, and the Utica/Point Pleasant in Ohio is no exception. Ratio of gas to liquids and longer term production decline rates (some steep initial production decline is quite normal) are both essential pieces of information to determine economics. The total production of oil & liquids vs. dry gas and the ratio of liquids to gas are both important factors that will contribute to economics. Longer term price of natural gas will also be a huge factor. If the price of natural gas makes any wells less economical now, some time in the future we will likely see improved economics, especially if LNG exports begin and additional uses for natural gas are developed. IMPORTANT Note: Gulfport Energy has released Production well flow TEST data on nine different wells, at least to date, but only two are classified as producing. The other wells were tested and then flow was stopped, awaiting transport logistics. Total Utica Shale drilled or drilling AND not yet producing = 150. These are wells that may go into production in the near future. There are many things that can prevent the well from actually going into production (disappointing production test, lack of transport infrastructure, completion problems), but at least there is some expectation that production will ensue some time in the future.